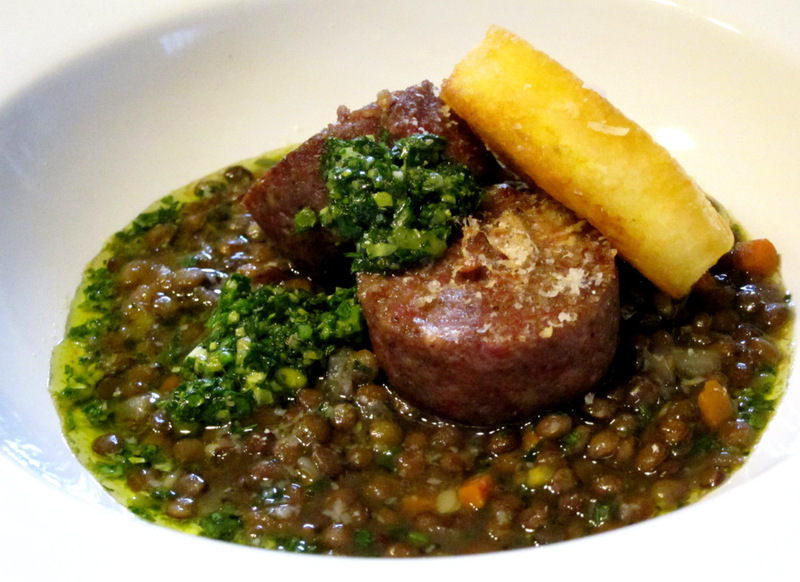 Every year for New Year’s Day I usually have a Cotechino served with lentils on the table for dinner. I posted about this Italian sausage before here. It incorporates a good proportion of pig skin into the meat mixture and ends up with the most amazing unctuous rich texture. It’s all offset by balanced spicing and sharp flavors that accompany it. 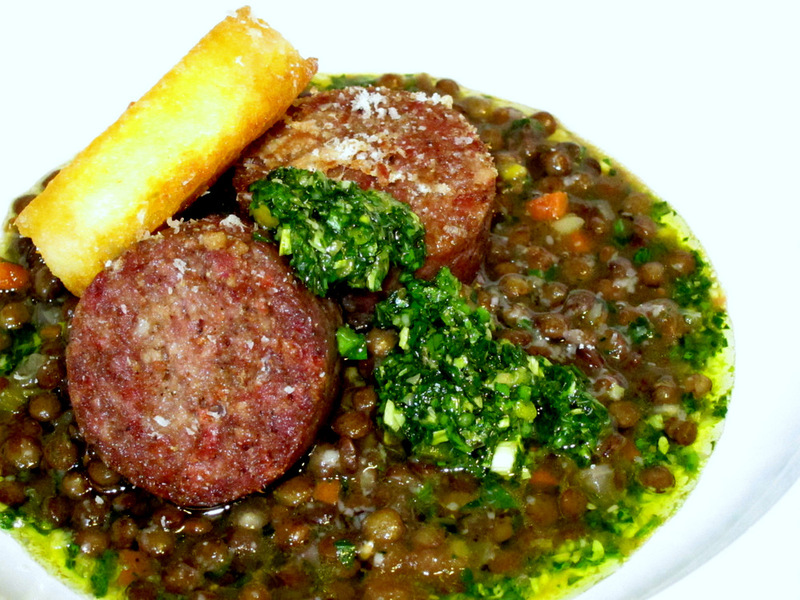 Cotechino is great with lentils, potatoes or polenta. I was going back and forth between serving it with the lentils or the polenta. Eventually I decided why not do both while at the same time dress the dish up a bit and sharpen the plating and the flavor. I also tried some new methods to take my pictures this time around going mostly manual as opposed to allowing the camera to pick the settings. There is a lot of room for improvement but I like the end result and am hoping to keep playing with that. On prior occasions when I made lentils to accompany the sausage, I primarily relied on a recipe that added tomatoes, stock, rosemary…That was a bit much. The sausage alone has a ton of flavor and does not need a heavy-handed side dish to clash with it. So, this time around I made a basic lentil stew. I used, as always, Puy lentils and just cooked them in sautéed onions, celery and garlic before stewing them gently in water with some fresh thyme thrown in. A final dash of salt and vinegar as well as a helping of salsa verde (more about this in a minute) rounded the lentils out very nicely. 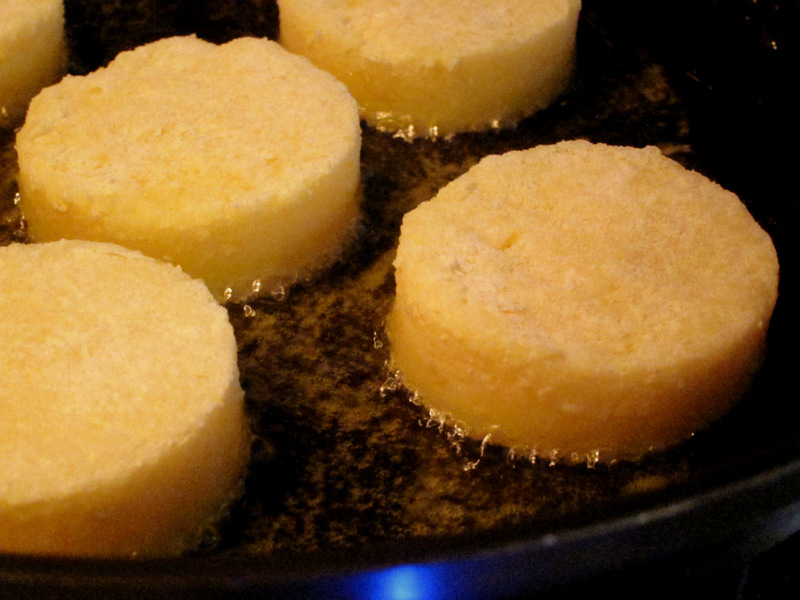 I prepared the polenta in the oven (about 4:1 water to polenta ratio, cooked uncovered at 350 F for about an hour). I allow it to set spread about 1/2 inch thick and then cut it into circles. 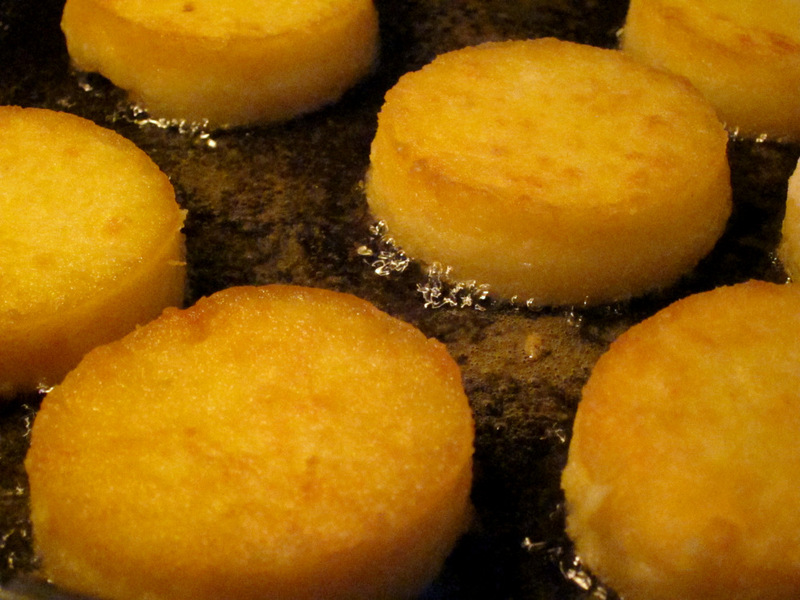 These get a quick dusting of flour and then pan-fried in olive oil to crisp them up. I wanted another layer of flavor to the dish and a salsa verde is it. This is one of my go-to sauces for everything from salmon to steak. It’s not the Mexican one that incorporates tomatillos in it. 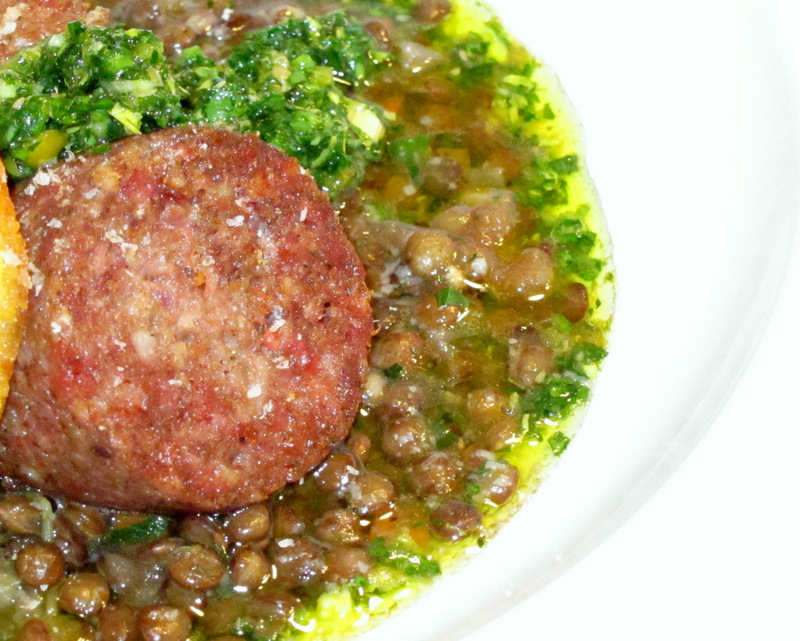 This Italian salsa verde is a herb sauce composed mostly of parsley. It’s basically chimichurri’s much better sister (sorry Argentinean sauce lovers!) I try to incorporate some portion of basil in there as well and even a few mint leaves if I have them. These get chopped up (as fine or coarse as you like – I like it on the fine side) with capers, a garlic clove or two, sour pickles and a couple of anchovies. To bring it all together a very healthy dose of olive oil is stirred in along with red wine vinegar, salt and pepper. Once you make it a couple of times you’ll get the hang of how you like it and can adjust the quantities of the ingredients accordingly. I first heard of it many years ago in Jamie Oliver’s first book and I still like to prepare it like he does, just start chopping the parsley and add more ingredients to the cutting board…chop chop…add a few more ingredients…chop chop…as you go. It’s a marvelous sauce with great flavors and textures. I tried a new time and temperature to cook the Cotechino sous vide this time as well. Per a suggestion from Jason Molinari I reduced the temp to 68.3 C and cooked it for longer, 24 hours. I like the result a lot but I think there is still room for improvement. Dropping the temperature to around 65 or 62 C and cooking it for anywhere between 24 and 36 hours might be even better next time around to preserve more moisture and flavor. I sliced the sausage and topped a few of the slices with grated Parmesan cheese before searing all the slices on both sides. The final dish was exceptionally good. Not too heavy, cloying or greasy at all. The flavors worked great and the green sauce looked awesome and was a spot-on complement to everything. 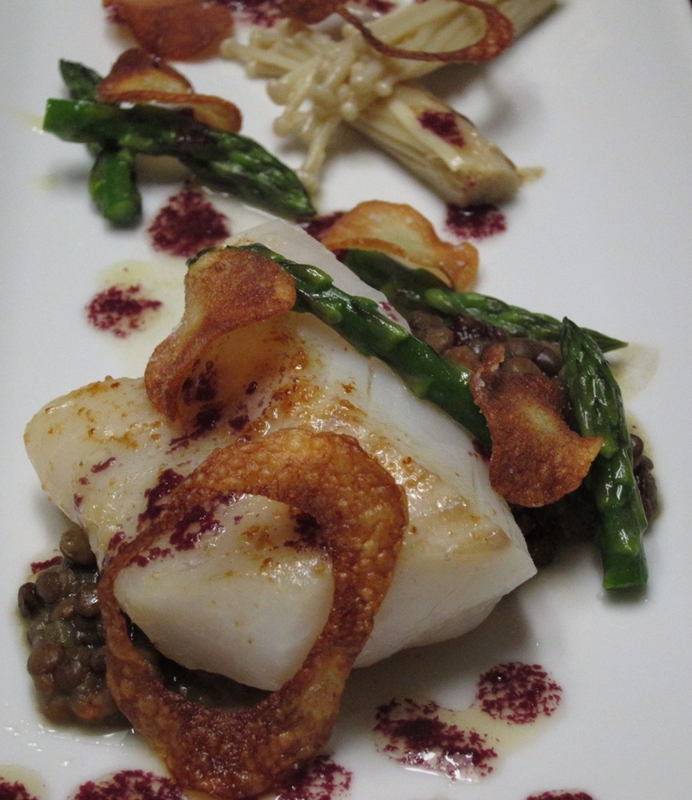 This is loosely based on an Alinea dish that has something like 30 different components. 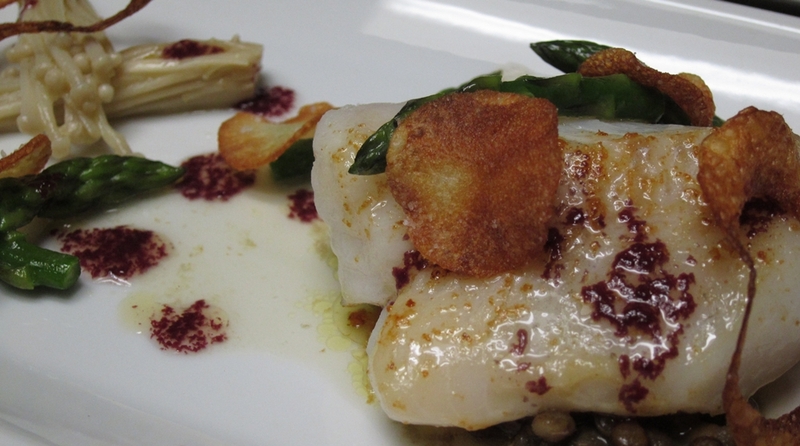 The Alinea recipe combines flaky white sea bass with lentils, a variety of mushrooms, purees, and a red wine glaze. Compared to my not very successful butternut squash dish that had the benefit of a lot of planning, this dish came together naturally, quickly and was a lovely dinner. I basically had the white cod and some time on my hands. 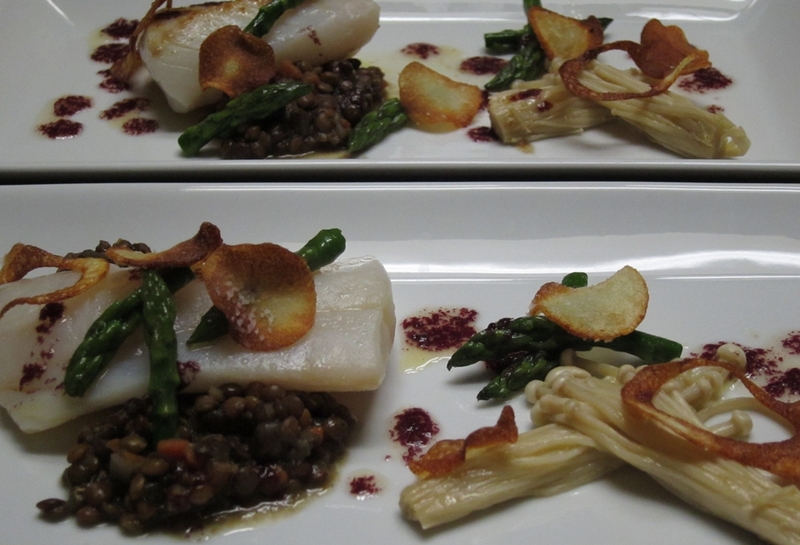 I remembered the Alinea dish and borrowed the idea of combining the fish with lentils and enoki from it. 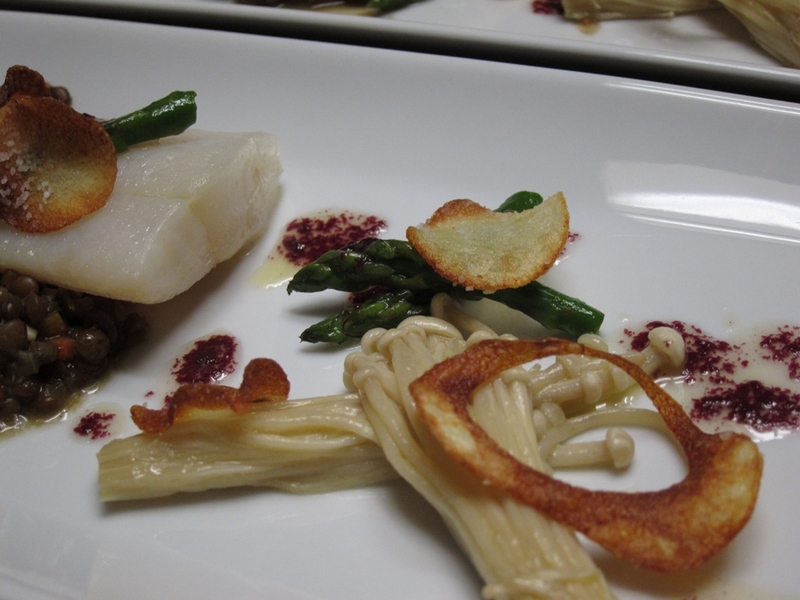 I also remembered a dish from Modernist Cuisine, based on an Eric Ripert recipe, that combines Escolar with beurre rouge (red wine butter sauce) and little rounds of fresh potato chips. Fancy fish and chips! To prepare the french Puy lentils I cooked them till soft and then stirred in finely diced and sautéed vegetables and aromatics. I seasoned them with fresh thyme and some of my homemade red wine vinegar. They had a perfect bright flavor and a wonderful “pop”. The potato chips were so good the kids and I almost ate them all before I got a chance to even start plating. I first thinly sliced a russet potato on a mandolin and then used a small cookie cutter to stamp out perfect little rounds. I am supposed to only use these rounds in the dish and dispose of the other pieces where the rounds where cut from, but after frying them all up they just had a very neat look. So I decided to plate them along with the perfect little rounds. The potatoes really elevated the dish. They gave it a refined look and added a ton of texture and flavor. Now, on to the “broken” red butter sauce. It’s not supposed to be broken of course, but I used it anyways. It was too late to make anymore and really it tasted and looked fine. Many a modern recipe, like those in the NOMA book, specifically go for this non-emulsified sauce look. I have tried to make this particular recipe for beurre rouge that uses xanthan gum from Modernist Cuisine three times now. The recipe has you make a reduction of red wine and aromatics, just like a traditional method. Then you whisk in xanthan and then the butter. The gum is supposed to make the sauce more stable and prevent it from breaking. Well, it breaks every damn time. I am not sure what the problem is, but I know that next time I will be making it the old-fashioned way. It might be more temperamental, but it has never broken on me. I cooked the fish sous vide after bagging the fillets with a few knobs of butter. For Diana, as usual, I quickly seared the fish right before serving. She loves a bit of color on her fish fillets. For me, I did not sear it. I much prefer the pure white and perfectly cooked fish. For the Enoki mushrooms, I made a butter bath (that just sounds nice) in a small sauce pan and gently poached them in there. I seasoned them with salt right before plating. Last component was the asparagus. I quickly blanched the spears in boiling water and then dropped them in ice water. I only wanted to use the tips, so I cut them off and warmed them in the same beurre monte that I used to poach the mushrooms.